Mad Truck Challenge – Racing is a fun race with elements of the action for Android from the studio Spil Games, in which we will conquer the continents, destroying virtual rivals. The game received an interesting design of numerous locations, decent cartoon graphics, good animation, and modest sound. Physics is also present in the game and it is quite playable, but, frankly, Hill Climb Racing is far from her. 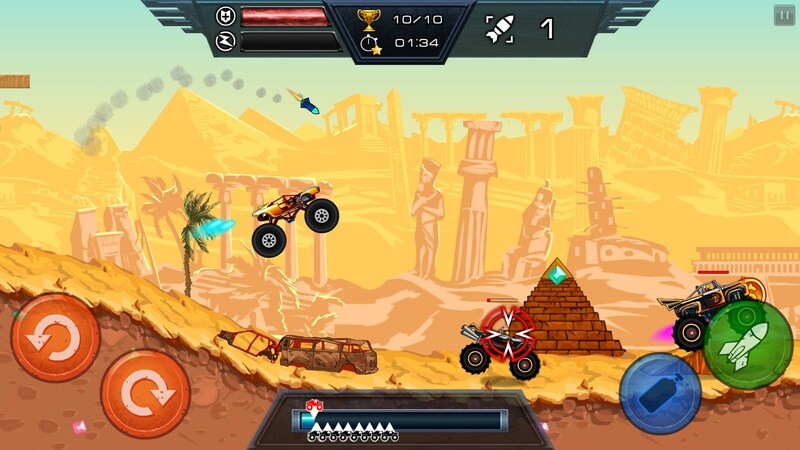 The gameplay in the Mad Truck Challenge – Racing is divided into separate levels, which, in turn, are scattered in unique locations. It all starts with races in the deserts of Egypt, but very soon we will open up other regions located on different continents of the planet. The peculiarity of the gameplay is that we always start the most recent. Actually, this is where the main task follows – to catch up with opponents and destroy them. Of course, you can try to just bypass rivals, but their cars are pumped quite seriously and simple overtaking is unlikely to decide something in our favor. Moreover, leaving the opponent behind, we substitute the stern of your car under attack. Given that the speed characteristics of other cars often exceed those of our car, lagging quickly catch up and start to ram us. Of course, this leads to damage that cannot be ignored, but it must be admitted that the advantage in this regard is still on our side. That’s because the bonuses that come across on the road are designed exclusively for those who drive the car. Opponents simply pass by first-aid kits, nitrous oxide cylinders, and ammunition. But we can pick up all this stuff and use it at any time. The rockets in this game are self-guided, so you can not even wait for the target to appear on the horizon. The winged beast will still find its victim, even if the closest one is at the back. Depending on how successful the races are, we are awarded the appropriate amount of gold. Virtual currency is required for pumping existing cars in the garage and buying new monster trucks. Four virtual buttons are responsible for managing these races. The two left is needed to adjust the center of gravity of the car, while the right allows you to activate nitro or use a rocket launcher. The acceleration in the game is automatic, and the brakes are simply not provided. In general, the toy pleases. You can download Mad Truck Challenge – Racing for Android for free and find yourself an excellent lesson for the evening. Advertising appears quite rarely, and the need for internal purchases directly depends on the patience of the gamer. Step 4. Now type Mad Truck Challenge Racing in the search bar. After the search, click “Install” to continue and finish.